Two people contacted me when I announce on social media that my transit point to Bacolod is via Iloilo.The first was Peter,a University of the Philippines student and a native of Iloilo who happens to be going to Bacolod as well for Masskara 2012.The other,Znarf (uo,sakit sa bangs basahin) who is a young urban professional working in a local bank in Iloilo.I haven't met these people before.Thanks to social media,making friends has become a lot easy. I was initially surprised that somebody even bother to signify intention to meet me as Iloilo is uncharted territory for me and I don't know anybody there.I'm stranger to this because when I go to a place,it's either I contact people first prior to announcing my plan or I simply go under the radar and meet nobody (kasi ayokong makipagmeet kanino).In some cases,I reckon that some people feel intimidated with me they don't even dare suggest a meetup. I honestly didn't plan for this trip.I wanted Iloilo-Bacolod2012 to be as spontaneous as possible.All I did was to secure my plane tickets and accommodation.I was to stay in a budget accommodation in Bacolod with two bloggers who I also never met before.That's all.The meetup was something I didn't intend to pursue passionately.Mangyari ang mangyari.Make an effort but if things don't work out as planned,okay lang din naman.I know too well the pain which goes with expecting too much. Four years of blogging has taught me many things continues to do so each day.I had a lot of triumphs but I will not deny making a few mistakes along the way.I have hurt a couple of people,actions that I continue to amend with the wish that I don't add to my trespasses.I also understand that misunderstanding are a fact of life and are sometimes inevitable,even necessary.Time has taught me to be cautious,of other people,and of myself.That I should constantly be vigilant from my actions and motives.There is no doubt though that there is joy in meeting new people,in creating new bonds,new friendships. Speaking for motives.I also have to admit that I intentionally engaged in meeting people for the sake of marketing myself as a blogger.In many cases,I took advantage of meetups to boast of my status as a blogger.But life has a wonderful way to teaching us.It has made me realize that as a blogger,I am nobody.I am no celebrity.And being a nobody could be a good thing. There are other important things in life ---things like friendship,camaraderie.........kindness. Acts of kindness,no matter how simple,no matter how small, can have a very big impact. Peter fetched me from the airport,he was waiting for me when I landed in Iloilo International Airport via Airphilexpress.I learned later on that he also flew from Manila that same day taking an early flight.He dropped by their home for a few hours then went to meet me.From there,we took the FX to SM-Iloilo where we met Znarf. Along the way,Peter related to me helpful insights about Iloilo.I was in a new place with very little knowledge but I felt safe knowing that a buddy I can trust is beside me. Znarf was a surprise.We communicated via blackberry messenger prior to the trip and he said about wanting to meet me event briefly.He said he wants to hand me "pasalubong".I was caught off guarded when he appeared in SM with a bag of local delicacies.I felt bad knowing I didn't bring anything for him.Owe you one,buddy. Peter was also Bacolod bound and we were in a hurry to catch the ferry and get to Bacolod the soonest time for Masskara.I got to convince Znarf to accompany us to the ferry terminal.I wanted to at least have a little chat with them.Little chat indeed as he could only stay for a few minutes as he had to go back downtown the soonest.I thought he left somebody in SM.hehe.Brief moments,but lasting.Acts that I will always remember and hold dear in my heart. 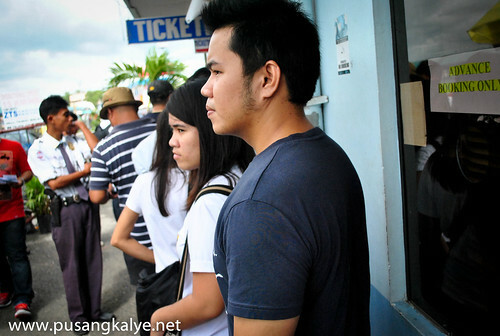 Peter and I continued traveling together to Bacolod.We purchased ferry tickets immediately.But since we had a few minutes spare time before boarding,he took me to Roberto's nearby to purchase Siopao for our meryenda during the 1 hour ferry ride.If not for that,I wouldn't have sampled any food in Iloilo as I was rushing to catch my return flight to Manila a few days later.I was running late so I took the taxi from the ferry terminal to the airport.No chance to even grab a simple take out meal. It was Peter who witnessed how panicky and frightened I was when the ferry navigated the rough waters between Iloilo and Bacolod.He saw the coward travel blogger that I am.We took the same jeepney leading downtown where my roommates were waiting.I was momentarily lost (as I wanted to get lost) for directions when I got off the jeepney and I felt the concern through Peter's text message. I felt like a little cub needing the protection of somebody and it felt good.All throughout,even when I was already with my roommates,I felt that people were looking after me.I felt cared for.Acts of kindness such as these warms my heart. For whatever their motives are,I have no right to question.What is important is, they have shown me kindness.To Peter and Znarf,my Iloilo Guardians,thank you for the friendship. 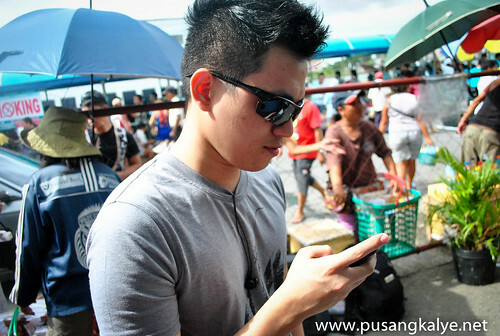 naks..... may tour guide sa iloilo. It's nice to have someone who knows the places better.